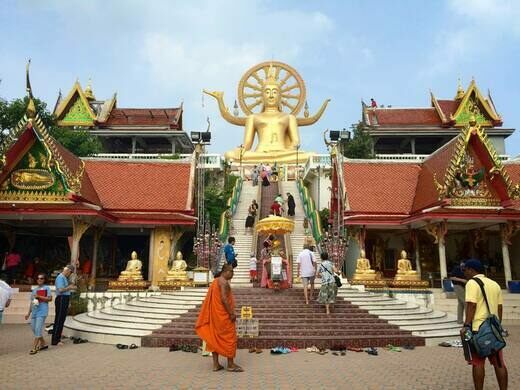 Though by no means an ancient temple (it was built as recently as 1972), Thailand’s Wat Phra Yai or “Big Buddha Temple” is still a cultural and artistic gem that’s well worth a visit. 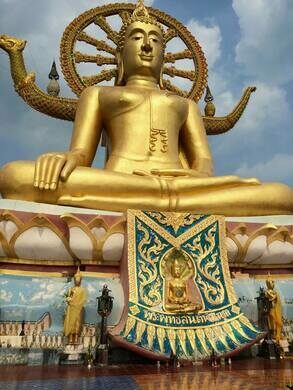 Buddhist university that allows English-language speakers the opportunity to study with monks in Thailand. 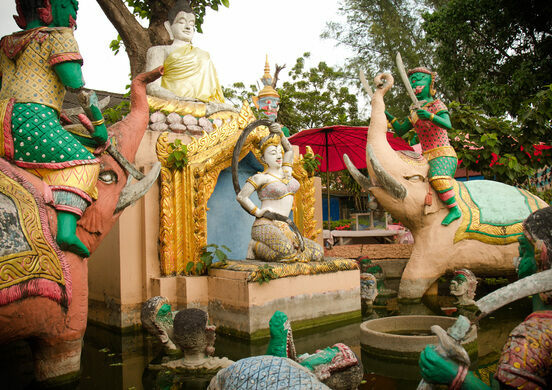 The temple complex is majestic, dazzling, serene, and perhaps a bit amusing all at once. Here, every available surface is drenched in gold and bedecked with ornate mirrored tiles the color of precious jewels. A wide skirt of steps flanked by two sinuous emerald dragons leads straight to the towering central figure: a 12-meter-tall golden Buddha. It sits atop a hill overlooking the stunning aquamarine waters surrounding the tiny islet of Koh Faan. Sitting in Mara pose, this Buddha represents a state of enlightenment, purity and calm. Reflecting these principles, a ring of large bronze prayer bells encircles the Buddha, gently swaying in the cool ocean breeze. Use one of the provided wooden strikers to lightly ring each bell for good luck as you take in the glorious views. In the early mornings, one can observe monks chanting their morning prayers as well as locals who bring offerings of food, incense and flowers. Be sure to pop into a few of the stalls surrounding the base of the temple during your visit. Local street food, fruit, flowers and fun souvenirs can be found aplenty. Neaby Chaweng Beach, Wat Plai Lem and Ang Thong National Marine Park are popular stops to check out during your visit as well. It is requested that visitors respect the sanctity of the space by wearing modest clothing (trousers or long shorts and tops that cover the shoulders), removing shoes before entering the complex and being courteous of local devotees. 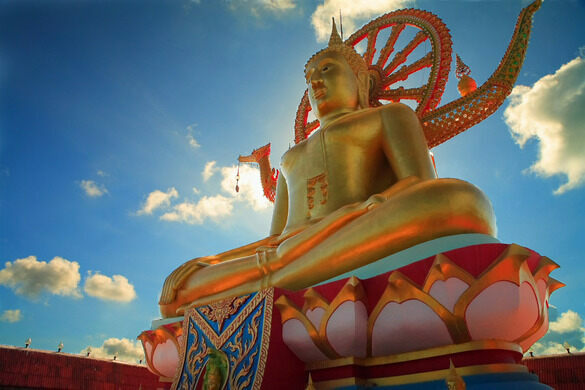 The temple can be reached via a causeway from the main island of Koh Samui. From the airport, head north on route 4171. Take the second right and the first left, then follow until the road ends.